The HyperGain HG5817D is a high-performance Compact Backfire WiFi Antenna that provides 17 dBi gain with a 25ï¿?beam-width for directional 5.8GHz ISM and UNII band applications. The weather resistant composite radome houses the "Backfire" reflector which is designed to minimize interference. 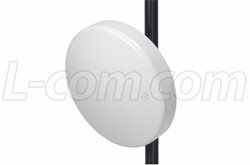 This antenna can be oriented for either vertical or horizontal polarization. If you have any questions about this product by L-Com, contact us by completing and submitting the form below. If you are looking for a specif part number, please include it with your message.